Mar29 Comments Off on Do You Have a Birthday Message for Jefferson? Do You Have a Birthday Message for Jefferson? April 13th marks the 273rd anniversary of the birthday of Thomas Jefferson, primary author of the Declaration of Independence and third president of the United States. And to celebrate, we’re throwing a Facebook party. 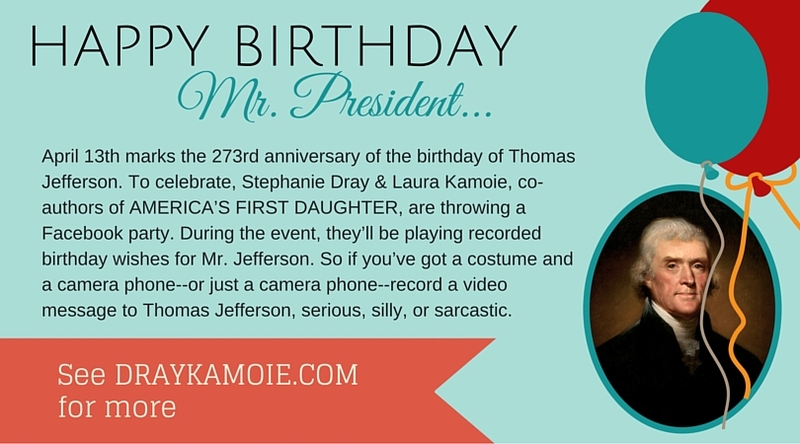 During the event, we’ll playing recorded birthday wishes for Mr. Jefferson. Amongst our lineup so far is General George Washington, so please do lend your voice to the birthday wishes! **Bonus points for holding a copy of AMERICA’S FIRST DAUGHTER in the video! ← Join Our Birthday Celebration!